With risks for both your baby and yourself, it isn’t worth it to leave your depression unresolved. You’ll often hear about postpartum depression, but did you know that many women also experience depression while pregnant? In fact, depression during the pregnancy (called antenatal depression) is actually more prevalent than postpartum depression. Unfortunately, antenatal depression doesn’t get the attention it deserves and, as a consequence, many women aren’t getting the help they deserve. If you are one of the millions of women who have depression while pregnant, you are not alone. While most women with this condition often don’t seek treatment, it is important to do so, as you and your baby can suffer if you don’t. And there are effective solutions to help you feel better that won’t compromise you or your baby’s health. One of the major risks of untreated depression during pregnancy is postpartum depression. If you don’t take steps to relieve your depression now, you’ll be more likely to have depression after your baby is born, too. With risks for both your baby and yourself, it isn’t worth it to leave your depression unresolved. But don’t turn to antidepressants first; antidepressants during pregnancy can lead to side effects for you, and risks for your baby. Read more about some of the antidepressant risks during pregnancy here. Instead, turn to these three options for natural depression treatment during pregnancy. Omega 3s are known to help fight depression, and they can help during pregnancy, too. Pregnant women who took 1 g of omega-3 capsules for six weeks saw a significantly larger reduction in depression scores compared to a control group. In another, women who took 3.4 g per day of omega-3 had significantly lower depressive symptoms after eight weeks than those given placebo. This supplement is considered safe and didn’t produce any adverse effects. Low omega-3 levels in pregnancy raise the chances of postpartum depression, so getting more will help prevent depression after your baby is born, too. Aim for at least 1,000 mg omega 3 fatty acids (DHA and EPA) daily. Researchers suggest the ideal physical activity routine for pregnant women is one that is low to moderate in intensity, that is gentle, and that is adapted to each individual woman with the help of her healthcare providers. Yoga can be a great option for getting exercise while pregnant. Gentle and easy on your body, yoga has been shown to significantly reduce depression levels in pregnant women. A recent study found that women who spent more time sitting during the second trimester were more likely to be depressed, so even if you don’t feel up to a rigorous routine, at the very least sitting less and moving more should be your goal. Exercise also helps pregnant women to improve cardiovascular fitness, reduce the risk for gestational diabetes, prevent weight gain, and more. Read about some of the benefits of working out while pregnant here. 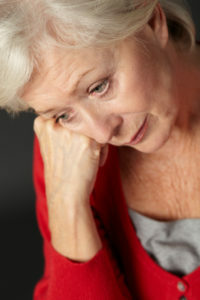 Bright light therapy uses light exposure to treat depression. It is extremely safe, and studies show that it can be useful in treating antenatal depression. [9,10] Bright light therapy is also effective for postpartum depression treatment. Find light boxes that are available commercially, and try looking for 7,000 to 10,000 lux illumination. Use it for 30 minutes in the morning after waking up. Don’t put the health of yourself, or your child, at risk; seek help today. Work with an integrative practitioner who can advise you on your options and help develop a treatment plan right for you. For help with postpartum depression, read 5 Postpartum Depression Treatment Options. Did you get depression while pregnant? Did you successfully treat it, and if so, how? Share your tips in the comments section below. BMC Psychiatry. 2015 Feb 5;15:14. J Midwifery Womens Health. 2015 Oct;60(5):479-82. Neuropsychiatr Dis Treat. 2015 Feb 19;11:405-11. Int J Community Based Nurs Midwifery. 2014 Jul;2(3):142-7. J Am Diet Assoc. 2009 Sep;109(9):1566-75. J Clin Psychiatry. 2008 Apr;69(4):644-51. Science Daily News Release. 2015 Nov 3. J Clin Psychiatry. 2004 Mar;65(3):421-5. J Physiol Anthropol. 2012 Jun 6;31:15.
antidepressant, antidepressants, cardiovascular, cardiovascular fitness, depressed, depression, depression treatment, depression treatment options, depressive symptoms, diabetes, diet, exercise, fight depression, fitness, for depression, gestational diabetes, health, health problems, integrative, light therapy, massage, natural depression, natural depression treatment, natural treatments, omega 3, omega 3 fatty acids, omega 3s, physical activity, postpartum depression, postpartum depression treatment, pregnancy 2, prevent depression, side effects, studies show, suffering from depression, supplement, to treat depression, treat depression, treating depression, weight gain, women's health, womens health, working out while pregnant.